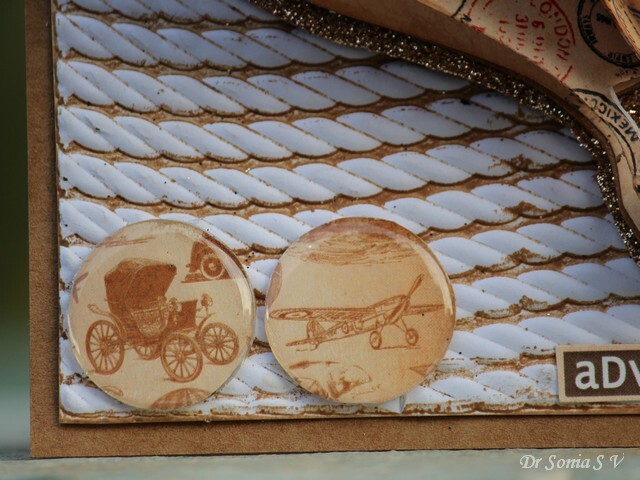 Hi friends so happy to share my first DT post for the Cuttlebug Mania Challenge. 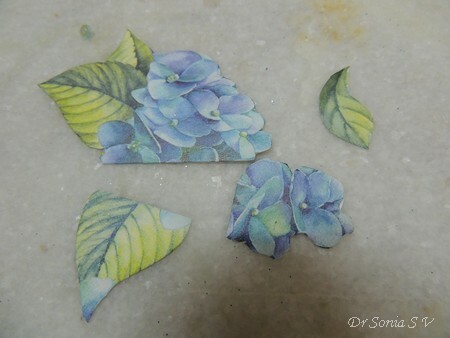 Most of you who visit my blog will know that I just loooove die cutting ! 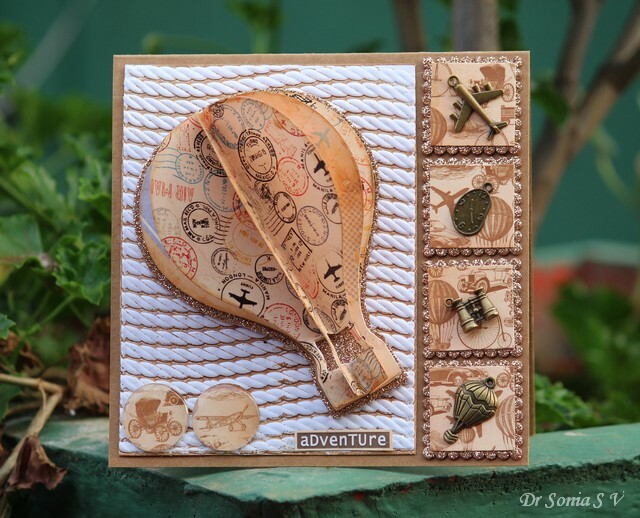 So when Jannie the owner of Cuttlebugmania Challenge blog invited me to be part of her DT team...I just couldn't refuse her .The Cuttlebugmania Challenges focus on projects using a die cutting machine and the theme this month is masculine and titled "We Mustache you a Question"! Masculine cards are not an easy option for most of us I know!! My husband likes flowers and butterflies so I am not used to making the typical masculine project either! 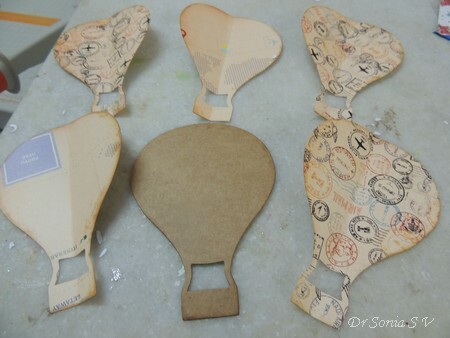 I die cut hot air balloon shapes using a Spellbinders Contour Hot Air balloon die. 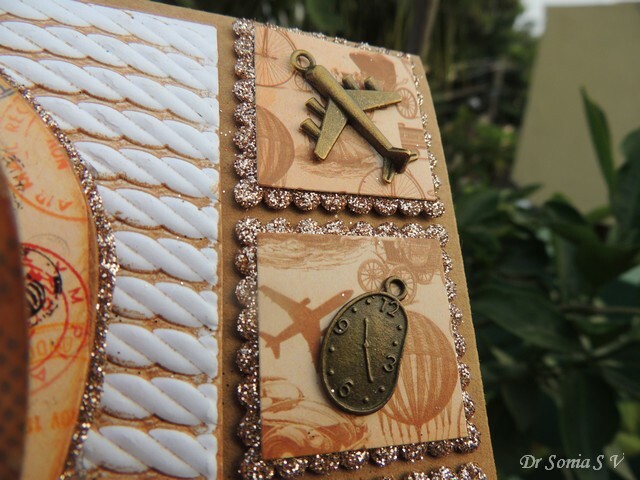 This die is like the sizzix BigZ dies and can cut thin chipboard and fabric as well! 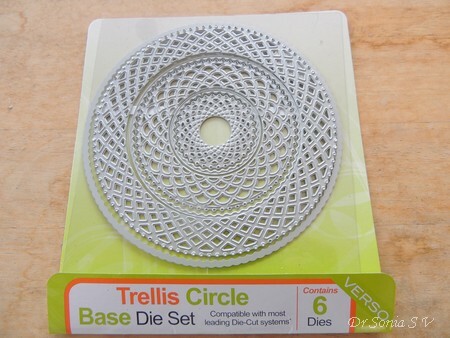 If you have a BigZ die or Contour dies[ from Spellbinders ] you can cut multiple sheets of paper in one go and these are perfect if you want to make 3 D shapes or make a lot of cards or party decorations quickly. 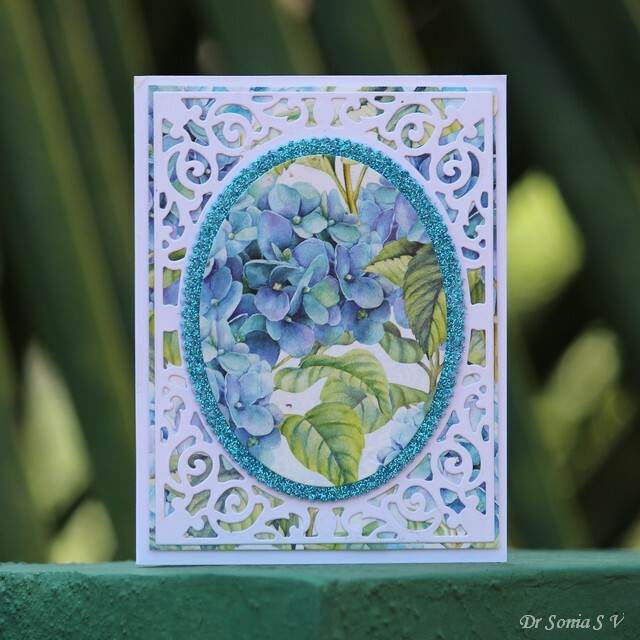 Use 5- 6 die cuts and ink their edges with matching ink. 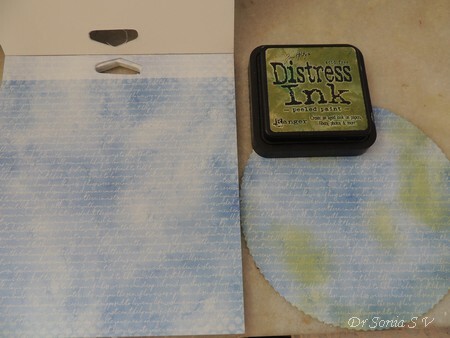 Here I used Distress Inks . Fold the die cuts...be as precise as you can in the folding! 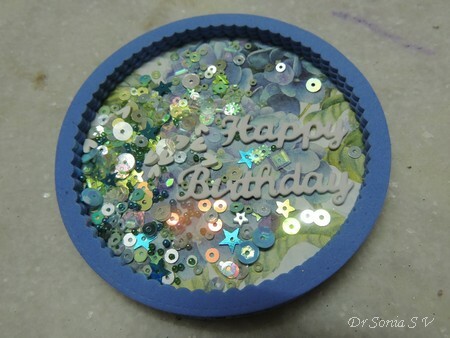 If you want to add the 3 D shape to a card...use a thick card stock for the base and stick the folded die cut shapes on top of it. Take your time while sticking the adjacent halves to each other.I found that using an odd number of die cuts over the base gave a more fuller symmetrical look!! 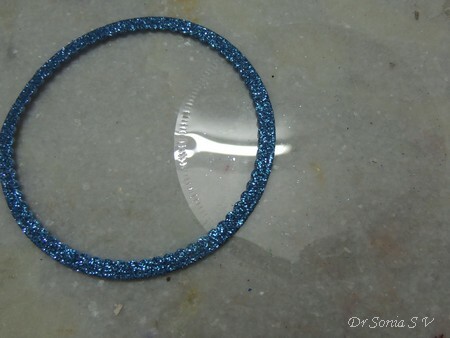 Optionally trace an outline of your die cut shape on glitter foam and hand cut it leaving a border so that you get a nice glittering border around your 3 D shape. 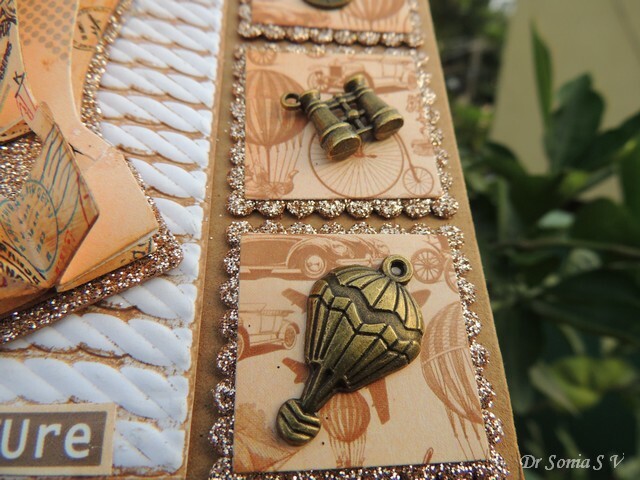 I wanted to highlight the gorgeous travel themed brass charms so made a background for each one using squares of pattern paper mounted on scallop squares of glitter foam. I used glossy accents[ clear and quick drying] to stick all the beautiful metal charms. I used clear acrylic discs over circles of pattern paper to create the embellishments above.They look like candy if you see them in real!! Hi friends sharing a simple handmade gift set I made recently for a friend. 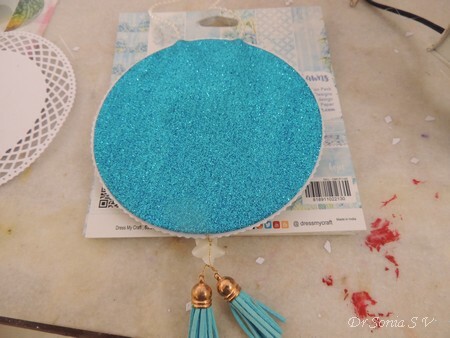 When you have to make something for someone who is the owner of one of the most amazing craft stores in India it is something of a mammoth challenge ! My crafter friends from India would have guessed I am talking about Shalini Mittal, the owner of Crafters Corner! I had many nervous self doubting sessions.... after all what do you make for someone who deals with the most talented crafters from all over the world day in and day out !! 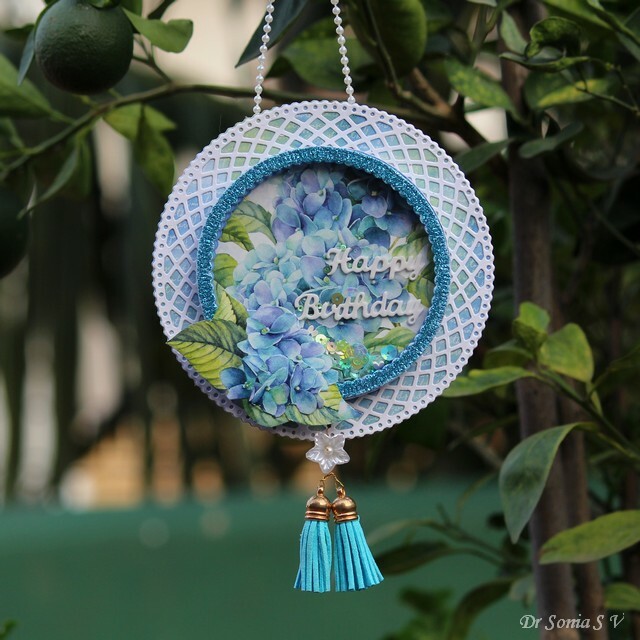 Well finally I decided to make a set using the gorgeous "Hydrangea Lawns papers " Shalini had recently launched under her own brand " Dress my craft"! I made a set of bookmarks, a shaker ornament and a simple card all featuring the beautiful hydrangeas and I fervently hope she liked it! This tutorial is a more refined version to show how to make a more sophisticated and neater shaker ornament! Glue - Good quality glue which is not too runny and doesn't take ages to dry. 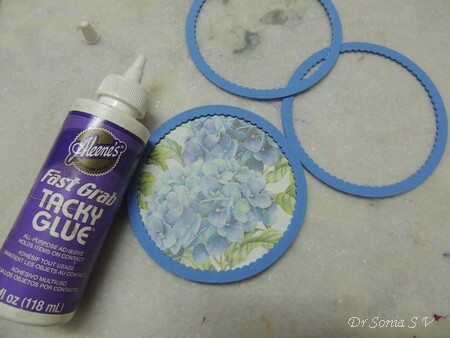 I am currently in love with Aleene's Fast Grab Tacky Glue. Shaker elements- beads, sequins, glitter balls, paper bits anything small and lightweight! 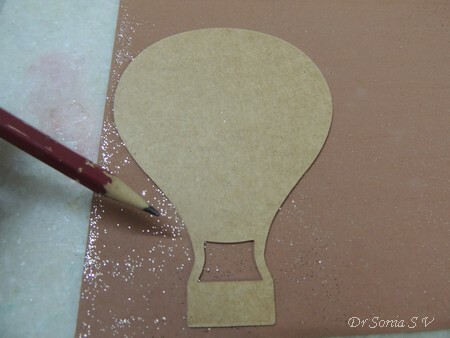 Foam- Use the thickest craft foam you can get your hands on. Pearl Strings/ Thread/Rope- anything to attach to your ornament so that you can hang it. Cut your base [ my base is circular] from pattern paper and thick card stock and adhere the pattern paper to the base. 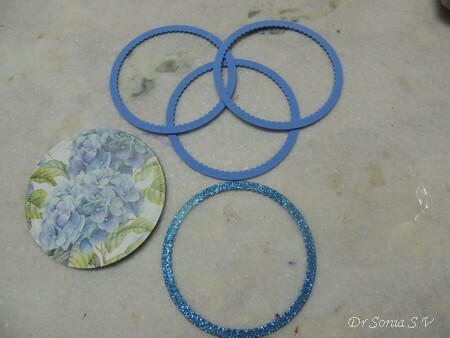 Cut 3 or more circular frames from thick foam. I used an MFT circle frame die so it was super easy. Adhere the circle frames atop the base and layer the frames on top of each other using a good glue. 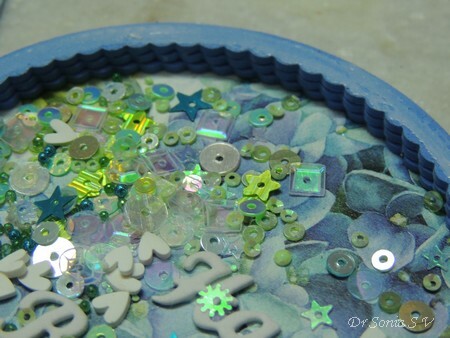 Avoid the hot glue gun as it can be lumpy , more messy and difficult to control. Allow enough time for the frames to dry as otherwise your shaker elements can stick to them. In the picture below you can see the advantage of using foam to easily make a deep shaker ! Stick on the acetate to another circular frame . 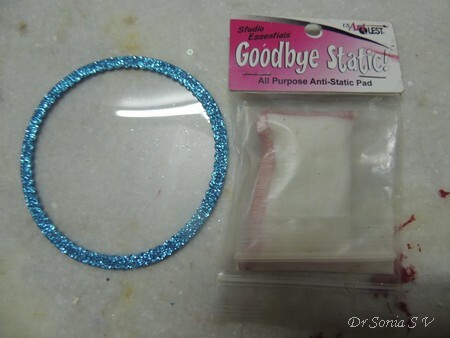 If you are really particular of not wanting your shaker elements to stick to your acetate give the acetate a light dusting with an embossing buddy / talcum powder like the one shown below. Be sure to give just a light dusting as otherwise your acetate can become foggy from too much powder! 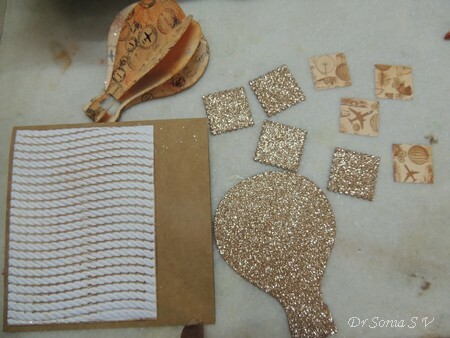 Now stick the acetate onto your shaker and you are ready to now add a few finishing touches! I cut a few flowers from the same pattern paper and added it to the glitter foam frame. 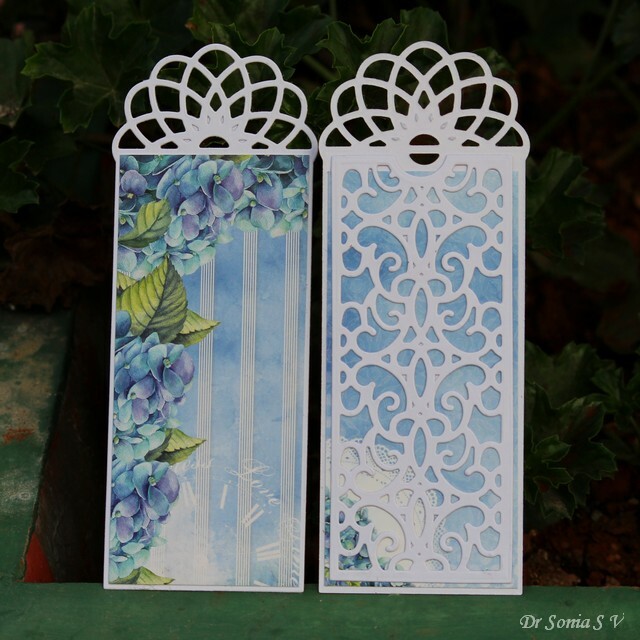 To form a decorative frame for the shaker you can use a doily or a beautiful die cut like the Tonic Trellis die I have used in this project. To form a matching base I used another sheet of pattern paper from the same set and sponged "peeled paint" distress inks for a touch of green so that it matches the rest of my shaker. Layered the white die cut trellis circle atop it. 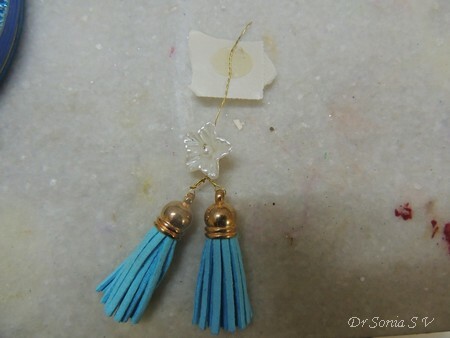 And here is how you can make a hanging dangler...take a wire or string...a wire is easier in some ways and thread beads or tassels on it...twist the wire. 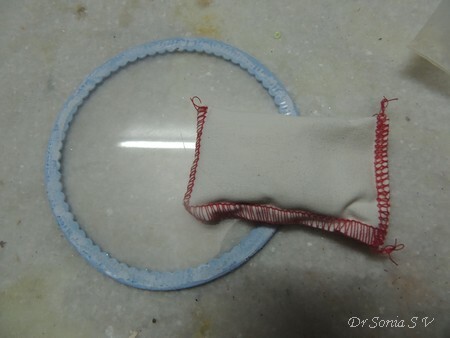 To attach this to your base...either you can punch a hole on the frame and twist the wire / tie the thread or add a glue dot and stick it to the back of your frame. 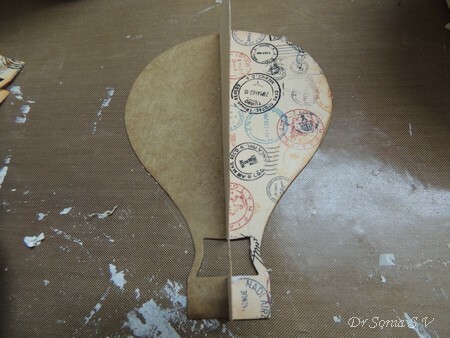 Use glue dots /washi /any sticky tape to position a string of pearl onto the back of your frame. You may have to adjust the position of the string till you are happy! 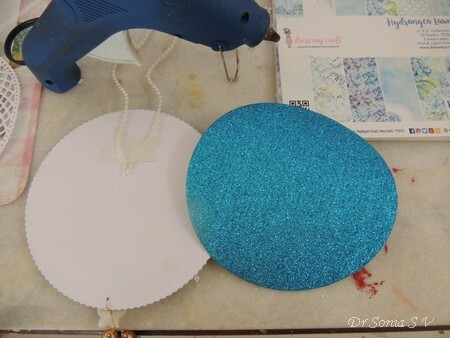 For the final finishing touch hot glue a big disc of glitter foam [which is the same size or slightly smaller than your frame] on the back ...this will hide the attachment of the pearl string and the dangler and give a neat finish to your project. And here is how it looks. 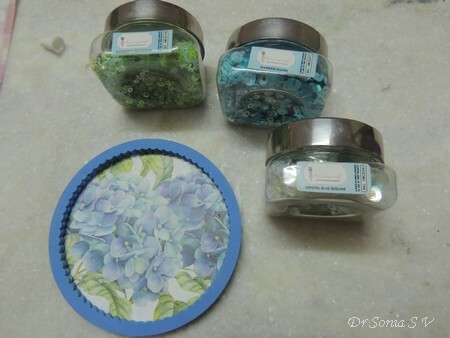 I hope Shalini liked this little handmade birthday gift set! And I hope the ideas will be useful to you my dear friends!